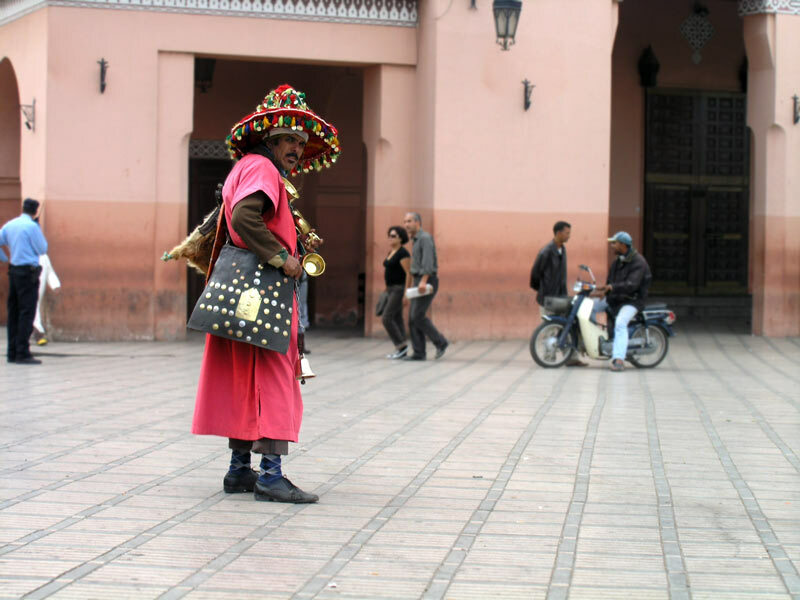 Travel Photo Blogging: What is so special about Marrakech? It surely has some good points, but I don't think it really has something you couldn't find at another place in Morocco. On the main square (Djemaa el Fna) you can find the cheapest (3dh per glass) freshly squeezed orange juice. You have to specifically ask to get it without ice and will probably be charged extra for the privilege. There are many snake charmers and watermen on the main square. If you never saw a snake charmer, this might be a good opportunity for taking some great photos, otherwise stay away - as they can get quite pushy. However you have to be aware that you will be expected to pay for taking a photo or even for taking a close look. I took a few photos, but from quite a large distance or from under my arm. In such a way I also got away with this photo of a waterman. They are there only for the show and don't have their original role any more (if you take a closer look at the guy on the photo that is quite obvious). Marrakesh (also spelled Marrakesh) is a big city with many interesting things to see. Sadly most of them are overrun by tourists. Consequentially the prices can be quite high. Hotel rooms we checked out were mostly quite expensive but at the same time were not at all that good. 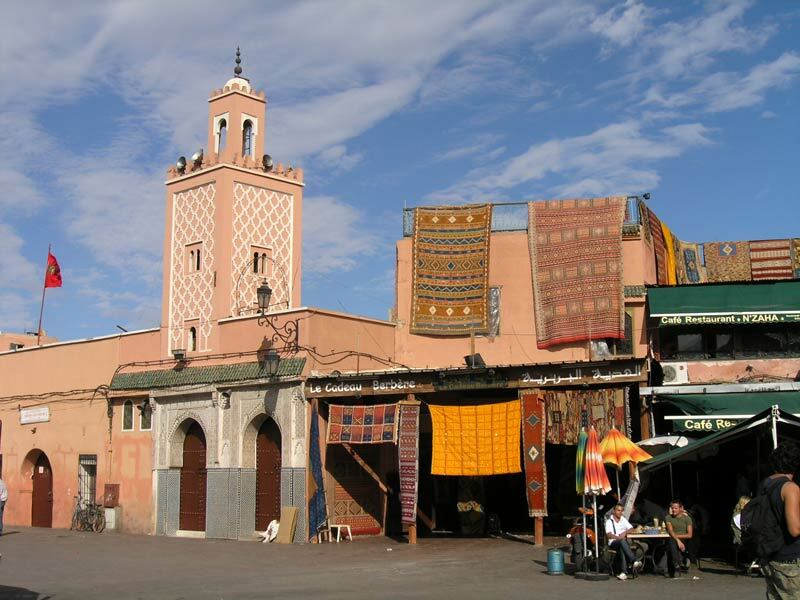 Usually the medina of Marrakesh is regarded as a shoppers heaven. I beg to differ. The architecture doesn't seem all that genuine (at least compared to the one in Fes) and it also isn't all that big. Locals often have a bit too arrogant approach for my taste. On the other hand it is not so strange that salesmen are mostly not too interested in haggling over a scarf. They can be pretty sure there is a tourist with pockets full of money waiting in line just behind you. It is still worth looking for a decent offer, but you have to look for it. Typically it is waiting for you at least a few streets away from the main square. I don't know if it is just me being weird, but I like Fes a lot more and would recommend it to anyone who has to choose between the two (you can read about my (a)mazing Fassi experience on this link). If you have a different opinion and like Marrakesh above all, please do share your views. I haven't yet been to Morocco but will definitely bear your thoughts in mind if I do plan a trip there. Wow - it looks great there. 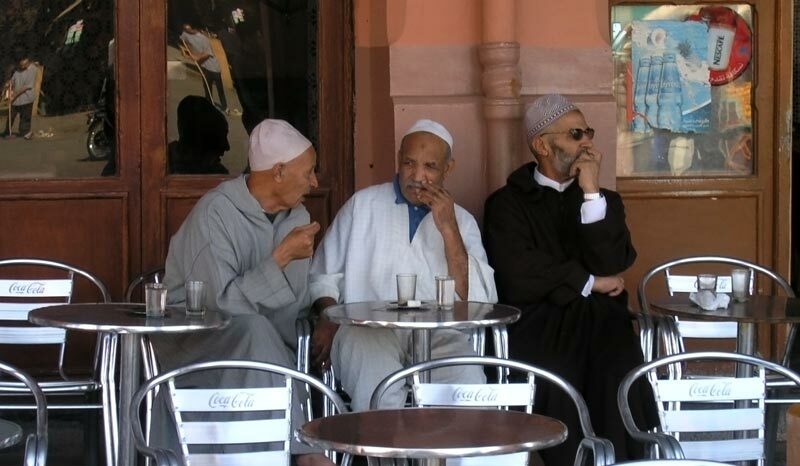 I'm really thinking of going to Morocco in December. Wow, these are awesome photos. I'd love to go to Morocco. This is just my opinion. You shouldn't take it as the only truth. That's really nice. I'm sure you'll have a great time. If you plan to do some mountain tracking, be sure to take weather conditions into concern (snow can be quite an issue). If you have some additional questions, feel free to drop me an email. Thanks Karen. It's always nice to get positive feedback.